The Montefiore Palliative Care Program is operated by the Department of Family & Social Medicine. Palliative care is the comprehensive care of patients with advanced and often incurable medical illnesses. Its goal is to relieve physical, emotional and spiritual suffering while preserving the psychosocial and physical functioning of the patient and his/family unit to the fullest extent possible. The Montefiore Palliative Care (PCARE) service provides consultative services for patients with progressive, incurable illnesses. 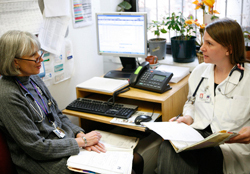 The PCARE Service provides coordinated interdisciplinary care on both a consultative and primary care basis. The PCARE Service works with patients and families to relieve symptoms, enhance quality of life, provide emotional and spiritual support, and assist with advance care planning. The service includes full time palliative care physicians from various departments within the hospital, nurse practitioners, social workers, bioethicists, and clergy. The service operates as an interdisciplinary team to address the full range of needs of patients, families, and caregivers. We offer a one-year ACGME-accredited fellowship program with three positions available annually. We accept applications through ERAS, and we participate in NRMP.